Getting to the Mt. Ashland Ski Area is easy. The Ski Area, located at 11 Mt. Ashland Ski Road, is just minutes from Exit 6 on I-5. The Medford International Airport features daily flights from Portland, Seattle, San Francisco, and more. Our SNOW BUS Shuttle service will pick you up in Ashland. 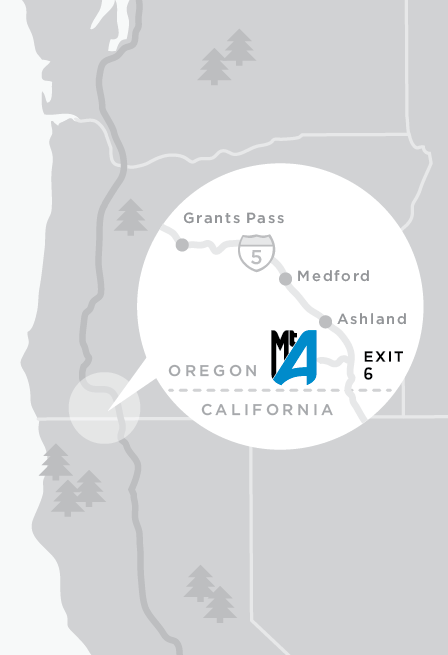 Traveling North or South on I-5, take Exit 6 and follow the signs 8.5 miles via the paved access road. Please note that there is over 2,000 vertical feet to climb on the road from the I-5 exit to the ski area parking lot. Winter driving conditions can change rapidly in the mountains. We suggest you carry tire chains. An Oregon Sno-Park Permit is required to park in the Mt. Ashland parking lot. We sell day-use permits for $6 and annual permits for $30. They can be purchased in the Rental Shop or the Lodge. Mt. Ashland offers our new transportation program: the SNOW BUS! We have two 15-passenger vehicles traveling to Mt. Ashland from the Ashland Hills Hotel & Suites all day on SNOW BUS operating days. No reservation is required. Just show up, hop on the SNOW BUS and start relaxing, because the trip is ON US! CLICK HERE for more information, or download a copy of the SNOW BUS schedule below.